With so many powerful photo recovery programs like RePicvid in the market, recovering deleted photos seems not to be a frustrating problem any more. However, sometimes it’s not possible to recover deleted photos without a little bit of damage, if you merely use a photo recovery tool to help you. Because, although a photo can be recovered, but it may be distorted for some reasons and you even cannot open it. In other words, your photo gets corrupted and can’t be viewable. Don’t worry, corrupted images can still be repaired. In the next passages, we will present some simple but useful solutions for corrupted photo repair. File Repair is a 100% free program to repair corrupted pictures with fast speed. Without ads or beg screens, it’s very easy to use. Firstly, click the load button to upload your corrupted files. Then tap on “Start Repair”. The File Repair will extract as much data as possible from the uploaded photo and create a new accessible file. Apart from photos, this tool can also fix corrupted music, videos, Word, Excel and PowerPoint files, as well as Access databases, Zip or RAR archives, PDF documents. 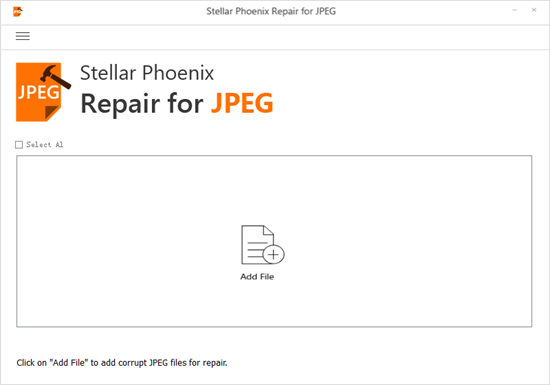 Stellar Phoenix Repair for JPEG is regarded as one of the best JPEG repair softwares. This reliable utility could fix damaged or corrupt images with JPEG or JPG file extension from internal/external hard disk, memory card, pen drive or any other storage devices. It can not only repair severely corrupted JPEG pictures without modifying its original data, but also extract the thumbnails of corrupted JPEG files and enable you to save them when the photos are indeed beyond repair. By the way, Stellar JPEG Repair also allows you to preview the recovered images before saving them. PixRecovery supports to fix various types of corrupted photos, including JPEG, GIF, TIFF, BMP, PNG and RAW images (.jpg, .jpeg, .gif, .tiff, .bmp, .png). It will save the repaired photos into a new image and you are permitted to choose to save them in bitmap or the original file format. Compared with the former two programs, PixRecovery is much more convenient. You just simply need to drag the corrupted photos to this software interface and click “Recover” to start the repair process. Note: PixRecovery requires an operating system of Windows 2000, XP, Vista, 7, 8, 8.1, 10, 2003 Server or 2008 Server. However, Windows 95, 98, ME and Mac are not supported.